Well, I have finished all the KFWE posts, and my past personal wine tastings posts, and now it is time to get back to posting about wineries I visited on my last trip. To remind you, I came to Israel for Sommelier 2017, then flew to Paris and back the next morning for the Bokobsa tasting. Upon my return to Israel, I drove north for a day, before coming back to the Jerusalem area, and then flying home. I have already posted all the wineries I visited in Israel’s North, excepting for my visit with Gidi Sayada at the lovely new visitor tasting room of Lueria Winery. We tasted all the new releases and as always, it is a joy to sit down and taste wines with Gidi. The wines that Gidi makes use the grapes that were planted by his father, Yosef Sayada some 22 years ago. The vines were planted on the hills surrounding Moshav Safsufa. Interestingly, Safsufa is an Aramaic word meaning – late ripening fruit. The burial place of the revered kabbalist Rav Yitzchak Luria, who was one of the foremost Kabbalist experts in his time, overlooks the vineyards. It is in his honor that the winery is called Lueria Winery. Lueria Winery has been growing slowly but surely, going from a few thousand bottles in 2006 to more than 100K bottles in 2016. Most people would not think that Lueria Winery is pumping out that much wine, but since Gidi started making wine, after learning winemaking in Israel, and cutting his teeth with Tal Pelter of Pelter Winery (not kosher) and Matar Winery, it is clear to see that he has found his own way now. With the abundance of his father’s grapes to choose from, some 45 acres, comprising many classic varietals, like Cabernet Sauvignon, Merlot, Cabernet Franc, along with some more Mediterranean varietals, like Syrah, Sangiovese, Barbera, and Roussanne. This winery, like many throughout Israel, is not afraid to make half of their wines – white wines. Why? Because contrary to the USA palate, Israelis have finally found the love for all things white and rose! Sadly, this year, Gidi did not make a rose. In its place, he started a new label, the 2016 Roussanne! Also, gone is the pure dry Gewurztraminer that we had a few years here and there. Now, he is making some dry Gewurztraminer and placing it into the lovely, Lueria White wine. The white varietals used in the winery are Gewurztraminer, Pinot Grigio, Chardonnay, and Roussanne. There are very few wineries in Israel making Pinot Grigio, the ones I know of are Dalton (a five-minute drive from Lueria Winery), Lueria Winery, and Yarden Winery. Each wine is stylistically different from each other. The Dalton PG is all about acid and fruit and is light on the mineral. Shockingly, the Yarden PG is less about fruit and more a balance between the fruit and mineral. Finally, the Lueria Winery PG is smoky and mineral rich, with nice fruit as well. Get them all and then taste them in a blind tasting! The red wine labels have been cleaned up, in both appearance and names. Now it is just two blends Rosso and Terrace at the first level, followed by two single varietal dominated wines, Shiraz, and Cabernet Sauvignon. With the Grand Vital being the flagship wine of the winery, which is a blend of the best barrels from each vintage. Its parts change each year but it’s mostly dominated by Cabernet Sauvignon, along with some Merlot and Cabernet Franc. Sometimes Syrah is added as well, but in the past many years that has not been the case. I think the streamlining and simplification of the labels, along with cleaning them up a bit as well, really makes for a lovely lineup of wines. Well, I am back, landing the day before the Shabbat preceding Shavuot. I was there for my Nephew’s wedding and we stopped off in Paris for two days – that post can be read/seen here. From there we jumped on an EasyJet plane and we were in Israel, but those kind of things do not just happen. In hindsight I would use EasyJet again – simply because there really were few other options. The direct flights were these (listed in cost order); Transavia (I wonder if the count sleeps in luggage), EasyJet, Arkia (Israel’s second largest airline), El Al, and Air France. I tried to use miles on AF – but they were crazy high. So, in the end, EasyJet it was. EasyJet is one of those airlines that will nickel and dime you all the way to and in the plane. But the best plan (since I had no checked luggage), is to pay for seat assignment and then you get a roll on and backpack. I was stressing about my rollon, it was a bit heavy, and I was worried they would nickle me to death. In the end, the dude at the counter was very nice and they took the rollon – asking to check it, which was fine with me. The trip was fine, as there is a lounge in the CDG terminal, and what we really wanted was just a place to be normal in a land of madness. Once we got to the gate they were boarding us only to leave us in the gateway for a good 25 minutes – no idea why. Once we boarded, I was asleep, which was a blessing. I had lots to watch – but sleep was what I craved. Once I awoke we pretty much landed, with maybe 20 minutes or so before landing anyway. Once we landed we disembarked quickly, and then well – no one was there at security check. There were loads of people backing into the anteroom. It would be another 20+ minutes before folks actually arrived and started to cut through the backlog. Once we got through our bags were there already and we were off to get our car – or try! Look I like Budget in Israel, they normally treat me well, but this trip was horrible! They made us wait 1 hour or more and then they treated us in classic Israeli style and gave us a car that was smaller than what we ordered/paid for and then told us to leave them alone! Love people like that! Anyway, we were off and really that is what I cared about – I wanted to be home! After that, I can say that the trip was really about tasting late 2014 released wines and 2015 wines. Before, I get into that – let’s recap the state of 2015. As stated here, this is what happened in 2015 and after tasting some 40+ wines from 2015 – nothing has changed my opinion. Well after two world-class vintages in 2001 and 2008, 2015 was a huge letdown. The white and rose are for the most OK, and nice. The white and rose wines are not at the level of 2014 (more on that below), but they are very respectable. The 2015 reds on the other hand is an entirely different subject. A few things going on here – first of all the weather was perfect through August – looking like yet another blockbuster Shmita vintage. Wet winter, tons of rain and no deep freezing, followed by very moderate spring (making for good bud formations). This was followed by temperate highs and nice cool evenings throughout the summer, except for a few spikes here and there, that was all until August! In August nature took a very dark view on Israel – starting with some of the worst highs in the history of Modern Israel, and power consumption that peaked for an entire week that broke record after record. August continued with crazy heat – but it was early September when all hell broke loose. 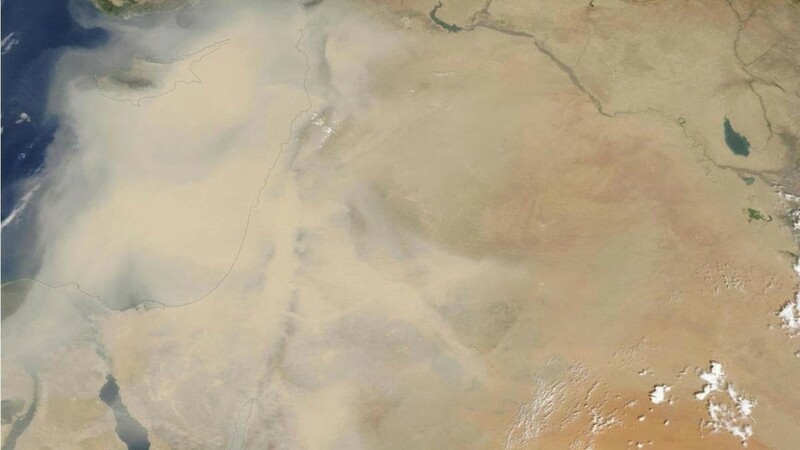 September saw a return of the epic sandstorm – but this time it reached almost biblical proportions in September. Just look at these satellite images – they are crazy! This past weekend I was hanging with EL and MT, those same two of Napa wine adventure fame. It was a true insane blast, and the wine intake was so intense that I had to name this post appropriately. The blueberry reference is an ode to the sheer number of wines we had that were seriously showing blue fruit. When I think of hospitality so many names come to mind including ER, Mrs. L, Shaindy and Chaim, and now I am happy to add EL and MT to the wonderful list of people who think of others above themselves. I came this shabbos to NY to hang with family and go to two wine events. The two wine events sandwiched a Shabbos so I asked EL if he could handle a madman like me for a weekend! He graciously accepted and now the Shabbos is in the history books and may well go down in annals of mankind as one of the craziest Shabbos that I have had the opportunity to enjoy (though my first Benyo Shabbaton is up there too with the Shirah Boys). The Friday started with me opening the bottle of Tavel, which while deeply aromatic was a slight letdown with a light and almost lifeless mouth. Still, it had the acid to keep up; this was all while we learned some Yoshua before heading to minyan. El lives in a large Jewish community and the number of synagogues within a square mile of his house, rival the number of museums in all of NY City! Still, we were blessedly spared the walks to those hallowed halls. Why? Think August in Las Vegas and add 90% humidity and you get the picture – AKA felt like walking through swap land – without the swamp! So, where did we go, well that is the funny thing, if there are tons of options for free standing synagogues in this section of New York, there may well be more options of home bound synagogues! Indeed, people have synagogues in their basements, living rooms, and just about any section of their home that their wives can tolerate (more on that in a bit). Friday night started in the library room of a beautiful home, 5 doors down from EL’s house. Mincha started at 8 PM and we were done with Mincha and Maariv at 8:45 PM. Heck, where I live, we could still be davening Mincha in 45 minutes! We went home, and even walking the length of 5 homes made you feel like you wanted to jump into a shower ASAP! What heat! Anyway, dinner started with a bottle of 2012 Lueria Gewurztraminer. A lovely wine that was cold and bracing, with enough residual sugar in it to make both EL and his wife happy! From there we moved to two Roses that accompanied a plethora of sushi! Awesome idea, really, clean tasting sushi is a great idea on a hot summer day! The sushi was solid as was CL’s SICK challah that was greatly enjoyed with dips and soup. The Tavel was OK, as said above but the Agur rocked it for me and it was mostly drunk by me as well. After that we moved to the main course, which was roasted chicken and some incredible Rib Roast! EL begged me to taste some before Shabbos and I knew at that point that this chunk of meat was going to slay it on Shabbos! The roast has something for everyone, it was rare inside and medium rare on the edges. It was herbed to perfection and was so juicy that it screamed to be eaten some more – WOW what a real treat! I just returned from a long and wonderful trip to Israel where I visited a total of 36 wineries in less than three weeks. To be fair, I was set to visit more, but let us just say that a family member, who will go nameless, slowed me down just a wee bit – LOL!!! All the same, it was great visiting the wineries, meeting the wine makers and owners, and getting a far deeper feel for all things wine in the land of Israel! Yes, I brought back many bottles, and I had friends and family who helped me schlep in even more bottles. In all some 30+ bottles or so made it back to the diaspora, and I will be enjoying them in due time. Many of them are NOT available here in America and some were just too good to pass up on. So, let us start with the facts – there are five wine regions in the land of Israel, and I visited wineries in all of them. According to Yossie’s Israel winery page that is a mash up of Google maps and his winery data, there are some 70+ kosher wineries. The kosher wineries are bunched up in the Judean Hills, Shomron, Samson, and the Galilee. There are wineries in the other wine region; the Negev, but other than Yatir, which is really the southern tip of the Judean Hills, there is no winery that I wanted to visit in the Negev (dessert – southern wine region of Israel). I started my wine adventure in the north and went to every kosher winery that would let me visit. One of the first things I realized about wineries in Israel is that it is a business. To me, wine and wineries are like candy and big candy store. To top it off – they are kosher and in a land I love. So, when I visit a winery, I want to know everything about it and why it exists. Others see me as a pain or as a lack of dollars and cents and as such, are not so receptive to my interests. That is fair, and as such, if I was received well I will state it and if not, or I got to taste a single wine or less, I will simply state what I tasted and move on. The first day, I dropped my stuff off at friends in the north and drove up to Tabor Winery. Tabor Winery ha recently been bought up by the Coca-Cola company of Israel, and as such has seen a fair amount of investment in both vineyards and winery facilities. They have some of the coolest high-tech gear out there, though a few others do rival them, including Yarden (which I did not visit this time), Yatir Winery (visited and loved it! ), Shiloh Winery, and of course Carmel and Binyamina (because their size allows for more toys). I was really shocked there and then by the cold blue fruit that exists if you look for it. By cold blue fruit I mean that wines (Syrah, Malbec, Cabernet – YES CAB, Petite Verdot, and Petite Sirah) exhibit blueberry, boysenberry, and other blue colored fruit when controlled in a cold enough climate. They had some lovely wines there, though no WOW wines (wines that get an A- to A or higher score). Still, a very nice and wonderful winery well worth the visit, if you can handle the drive all the way up there.